It’s hard to stand out with a traditional resume in a crowded pool of job seekers. Creating an infographic resume is an effective way to get more employers engaged and intrigued by what you have to offer. Although a more creative resume is a unique marketing tool to highlight your work experience, it’s also easy to get it wrong. Keep reading to learn why you should consider an infographic resume, when it’s appropriate to use a creative resume over a traditional one, and how to create a compelling infographic resume for yourself. We’re also giving you 17 free infographic resume templates to help you create your own unique job search tool. Infographic resumes are an attention-grabbing marketing tool that tell a career path by using images. Timelines, color schemes, and even profile photos are among the many types of visuals incorporated to convey a message. Infographics work well in any kind of marketing – yes, job searching counts as marketing – because the human brain is designed to respond to color schemes and visual storytelling. Visual storytelling can even work for a resume. As you use a traditional resume as a marketing document to sell your skills and highlight relevant work experience, adding an infographic can help you stand out even more. An infographic resume is a creative resume that is meant to engage the hiring manager, and ultimately get you an interview. An infographic helps viewers engage with the content and understand the message better. As a job seeker, your resume has to be able to do the same thing in order to land you more interviews. Infographic resumes are not for everyone, however, and sometimes a traditional resume will be more appropriate, depending on the situation. Creative resumes are an excellent tool for job seekers to use in addition to a traditional resume, and in some cases, when done correctly, an exceptional infographic resume can replace a traditional resume. Keep reading to learn why you might want to team up an infographic resume with your traditional one. A more visual resume helps ensure that an employer will remember you. Not only do you stand out with a creative resume, but you can use creative infographic to highlight the most important aspects that you want employers to see. Straying from the traditional resume format allows you to show your creativity, personality, and design sensibility. If an employer is looking for a creative individual to fit their job description, an infographic resume is a great idea because it acts as a sample of your work, whereas a traditional resume may limit you from showing your unique talent. Think of your infographic resume design as a portfolio piece. In addition to design, an infographic resume allows you to showcase your skills in marketing, branding, writing, presentation, and social media. When you’re not constricted by the generic format of a traditional resume, you have the freedom and flexibility to represent your skills in a way that comes naturally to you with your infographic resume design. Even if you’re not in a creative field, these skills are impressive to an employer who knows that everything in business is lending itself to the more digital, visual world. While infographic resumes are effective among the right employer, they’re not meant for every professional field. Some professions – like law or healthcare – will always want to see a more traditional resume. Stick to the black-and-white formatted professional resume designs for the more conservative professions. Infographic resumes are great for job seekers in a creative industry or profession. If you’re a developer, web designer, or writer, a creative resume format is right up your alley. Even job seekers in the marketing industry can benefit from a more visual resume, because they are showing creativity in how to market themselves to the employer. In many cases, it may be appropriate to send an infographic resume along with a traditional resume. If you’re not sure of whether to use one over the other, sending both can be a good choice. The employer gets the information they need as well as the bonus of seeing your creativity at work. Infographic resumes also come in handy at in-person networking events. Job seekers can hand their infographic resume to a potential employer and immediately capture their attention. The employer is able to digest the visual information much quicker in that moment than a paragraph-form resume. Though an infographic resume is a great way to stand out, you want to be sure you stand out in a positive way. It’s important to get the design right, so as not to overwhelm the viewer. Keep reading to learn what components and color schemes make for a great infographic design. Whether you do your own resume design from scratch, hire a graphic designer, or use an infographic resume builder, you always have the final say as to how your resume looks. 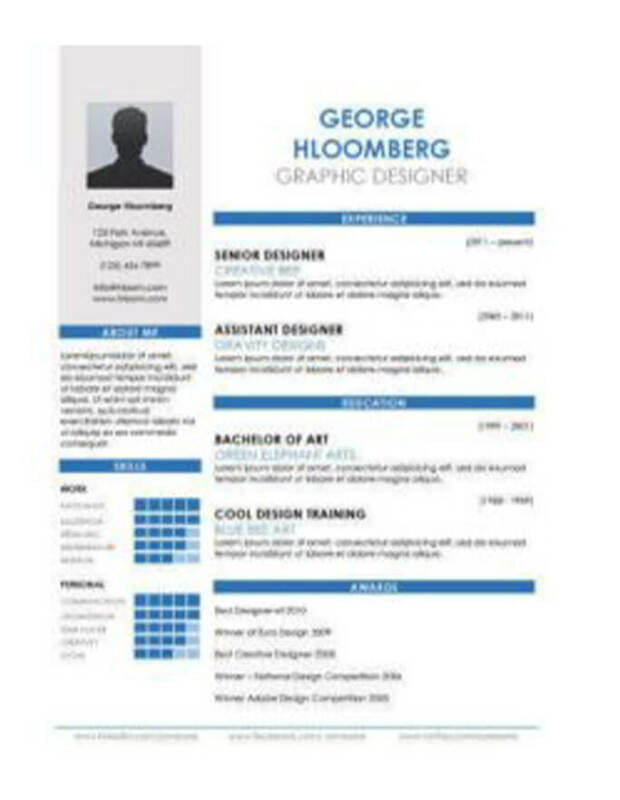 The elements you include will be similar to a traditional resume format, but will be displayed more visually. Header – This includes your name, contact information and maybe a profile photo. Skills and strengths – List your areas of expertise. Work experience – List your relevant work history. Achievements – Brainstorm a few things you’ve helped your previous employers to accomplish. Displaying your information in a more creative way with these features can be more effective to a potential employer. These features capture your work experience more creatively than a traditional resume format would. Clear to follow. The potential employer should be able to find your name, contact information, work experience, education background, and skills without confusion or distraction. These details should stand out immediately without having to follow the traditional resume format. Remember that a viewer’s eye will go from left to right, so the infographic resume design should allow that to happen naturally. Makes a quick impression. If the employer can’t understand your resume within 15 seconds, they’ll likely toss it. The display should be neat and straight-forward, catching the viewer’s eye in a positive way. While an infographic resume allows for more creativity, professionalism should never be compromised. Tells a story. While a traditional resume will have similar information, the goal of an infographic resume should be to visually tell the story of your career and career objective in a way that shows an employer why you’re the ideal candidate for the position. The story should easily convey who you are and what you do. Appears simple. Less is more when it comes to graphics. The appearance of your resume is crucial and should look professional by all accounts. Every image included should make a point, highlighting your relevant work experience and best qualities as a job candidate. Uses color wisely. It’s easy to get carried away with the color scheme in a creative resume, but doing so will undoubtedly overwhelm or distract the viewer. While too much color on a resume is not recommended, using the right colors can work to your advantage. There’s a whole psychology behind color scheme and the human brain, showing that certain color schemes align with specific traits. Blue, for example, is commonly used on resumes, because this color scheme is associated with trust, dependability, and strength, qualities that every hiring manager looks for. 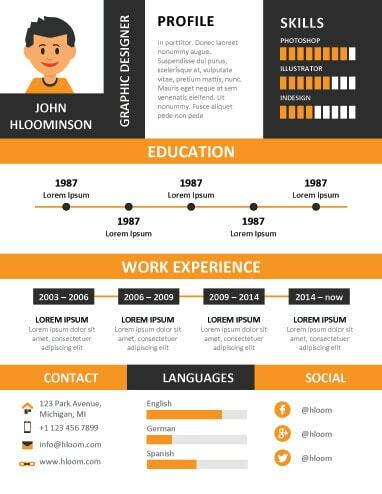 You don’t have to be a graphic designer to create a quality infographic resume. Our free templates take the guesswork out of design. Free and easy to use, these templates use effective icons, graphics, and color schemes that will help you landing an interview for your dream job..
Two-column layout with multiple sections for designer, computer, or education professionals with blue shading for headers and oversized blue squares to rank your key strengths. Broadcast yourself with this infographic template. Red, green, blue, and yellow provide style for header backgrounds and timeline chart. Light-gray metered graphs rank your skills expertise. Triangle flow diagrams showcase and connect your achievements. Light tans and reds used for shading with soft gray section titles. Programmer, accountant, or engineer feel for this sample. The pastel colours brighten up this example. Coloured dots make each experience stand out along with the dot graphs ranking your skills. Creative, public relations, event planners take a look. Presentation report style that uses bar graphs and grades to rank your skills and strengths. Blue tones for shading and icon with muted reds for section titles. A+ professional infographic for graphic designers, translators, writers, and marketing. This free infographic template is ideal for technically oriented professionals who need to convey competence in STEM-related skills in a way that is easy to understand quickly. It breaks down important sets of technical skills that could take ages to describe and conveys them in an easy-to-read simplistic graphical form that hiring managers will love. Add to that, the well-placed mug shot for a touch of personality and you have a winning combination of smart, and accessible. Network and programming administrators, human resource professionals, and managers use this sample with blue shades, profile picture, and serif fonts for appeal. Rate yourself with bar meters in the Skills and Personal areas. The simple resume template fits everything neatly into a small amount of space. It does this by making strong use of graphics and a smart typographical layout. A sharp photo, followed by to-the-point headlines, and a strong finish with easy-to-read graphical data make this resume template a job winner. Present your expertise through the red bar chart for achievements and bar meter for your strengths. Light blue backgrounds and shading define sections. Summaries of qualifications and bulleted lists fill the page with your expertise. This resume template delivers a very utilitarian feel for practical and smart professionals. It is bold, simple, and right to the point. Its strength is in its ability to convey vital information very rapidly. This bold resume design is perfect for individuals who want to stress general skills and ratings over specific company experience. By placing skills directly beneath a photo of the applicant, it establishes a strong personal connection to industry competence. Work experience follows beneath the “skills” section. Clear headings that cover all the essential elements, with a moderate use of colour to highlight each area. Vertical, orange-tabbed section titles with white background on light blue-shaded page highlight all your accomplishments. Great sample for librarians, administrators, teachers, or customer service. Highlight attributes with a blue-shaded bar chart to rate your expertises. Three-column areas for traditional sections and a paragraph-style objective or qualifications area. This resume shows at a glance which are your strongest areas. Make sure your strengths match the essential job criteria. The Resume Template is friendly and direct with an approach that is both personable and data-rich. When you need to convey personality, a photo is hard to beat. Combine that with easy to ready data that will get the hiring manager on your side and you have a very powerful resume format. This template is ideal for artistic positions or anything creative that still requires objective results from applicants.